I’m gonna take a break from writing about photography for a minute because I promised someone that I would write a follow-up to a previous post about my experimental New Balance shoes. After all, they gave me a free pair of shoes, so the least I can do is share what I think about ’em. I’ve now had about a month to give them a run for the money (pun fully intended …maybe that’s why it’s not funny) and overall I’m very impressed. For starters, I have an absurdly wide foot. I have always had a hard time finding shoes that fit. 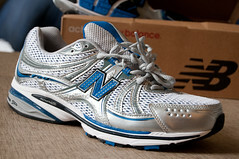 Wes, the owner of Tri City New Balance, was able to find a shoe that was a perfect fit on the first try. In fact, they might very well be the best fitting pair of shoes I’ve ever had. I was amazed that Wes was able to determine what would be best for me without ever meeting in person. He clearly knows what he’s talking about. So far they have held up surprisingly well. Granted, I’ve only had them for a little over a month, but compared to my last NB experience these new puppies are in a whole new league. I’ve taken them out for some hiking, walking, biking, and playing some friendly football. The laces on them are ingenious. They appeared to be somewhat lumpy, but when I stopped to consider why I realized that they stayed tied (and tight) better throughout the day because of the bumps in them. Unlike every other shoe I’ve had, these don’t feel like they gradually loosen by the end of the day. It’s subtle, but it makes all the difference. The only thing I don’t like about them is the little plastic “N” on the sides of them. I think they could have done a better job incorporating it into the design of the shoes, but as it is, it feel like they designed the shoe and then said, “Shoot, we’ve got to put our signature ‘N’ on here somewhere. …ah, just glue it on the side there.” After examining it further it’s clear that it was more intentional than that, but it still feels cheap for an otherwise fantastic shoe. Thanks again to Wes for reaching out to me and changing my opinion of New Balance! I’m a fan and I would gladly recommend them to others. Shameless plug, baby! This entry was posted in The Watercooler and tagged customer service, New Balance, satisfaction, shoes, social media, Tri City New Balance by Stephen Elliot. Bookmark the permalink. Stephen – curious how your shoes are doing and most importantly your feet? The shoes are holding up great! Thanks for the follow-up.